A deep red base with flaming yellow tips. Let the Fox Flame add some heat to your tank! Price is for a 3/4″ frag. With a unique growth and electric yellow coloration, this coral is a great piece to add to your tank for some some extra "pop" on your personal reef! Price is for a 1" frag which typically will have at least 2 branches. A brilliant red acropora with electric pink polyps! Price for 3/4" frag. Example frag pictured. One of the brightest Montipora in our collection! 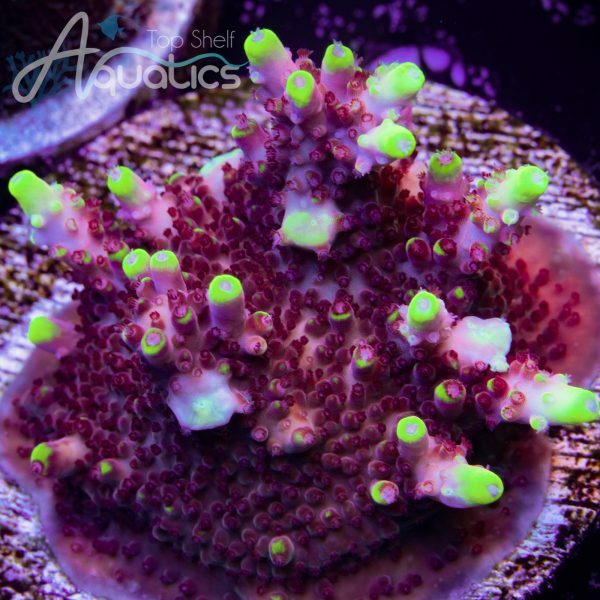 Electric gold with a green polyps and a vibrant pink growth rim! Price is for a 1/2"-3/4" frag.